THERE’S certainly no shortage of restaurants in Singapore. New places show up on the radar every month or so, offering a promised land of top-notch cuisine and service within their walls. Yet, why is finding a place for a romantic date always such a conundrum? Because everything has to be perfect, whether it’s for a first date, or to celebrate a special anniversary. These restaurants offer almost everything you could ask for; a beautiful environment, intimate spaces and an intuitive service team that’ll play wingman when they have to. We suss out the best that’ll guarantee wonderful memories with great food to match. This one-Michelin-starred restaurant is often at the top of the lists of romantic restaurants, but can you really blame anyone for agreeing? 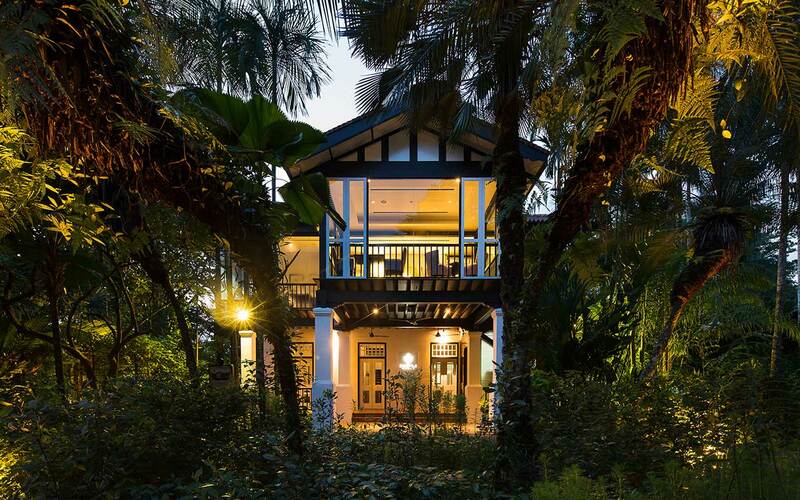 The two-storey black-and-white bungalow is a glistening jewel housed in the Botanic Gardens and offers tasteful spaces accompanied by panoramic views of the lush vegetation around. The Whispering Corner, a whimsical space for two by the verandah, is a hot spot for proposals. If you’re done gushing about the place, the French-inspired degustation menus and impressive wine list will leave you and your partner swooning. Corner House, 1 Cluny Rd, E J H Corner House, Singapore Botanic Gardens, Singapore 259569. Tel: +65 6469-1000. There are a few rooftop restaurants to consider in Singapore, but Jaan offers an unparalleled experience. 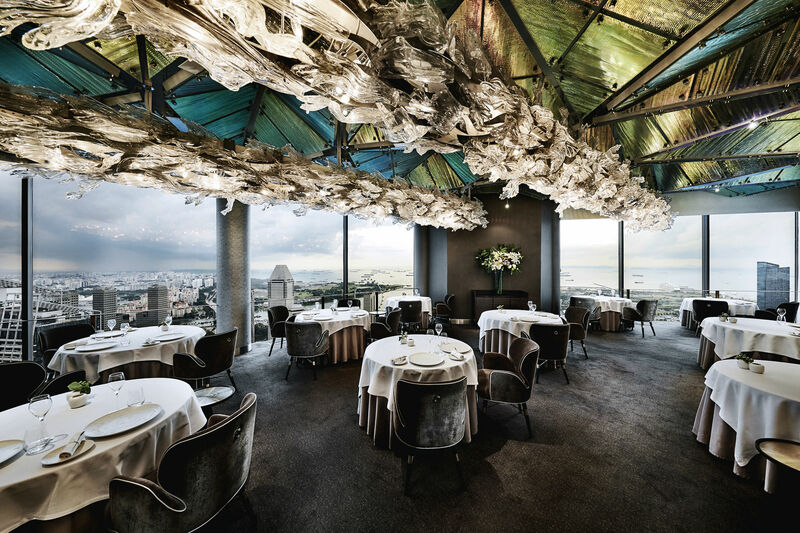 The classic fine-dining establishment offers a sophisticated space, amped up with stunning free-form crystal chandelier across the ceiling and breathtaking views of Singapore’s CBD. The menu here is an exploration of chef Kirk Westaway’s childhood in England, favouring natural flavours and seasonality and offers some beautifully plated dishes. Think a mini garden of over 30 different types of vegetables, flowers and herbs — a dish that is as delicious as it is Instagram-worthy. Jaan, 2 Stamford Road, Swissôtel The Stamford, Level 70, Equinox Complex, Singapore 178882. Tel: +65 6837-3322. Led by chef Julien Royer, Odette is considered one of the country’s most impressive restaurants, yet eating here is anything but a stodgy affair. 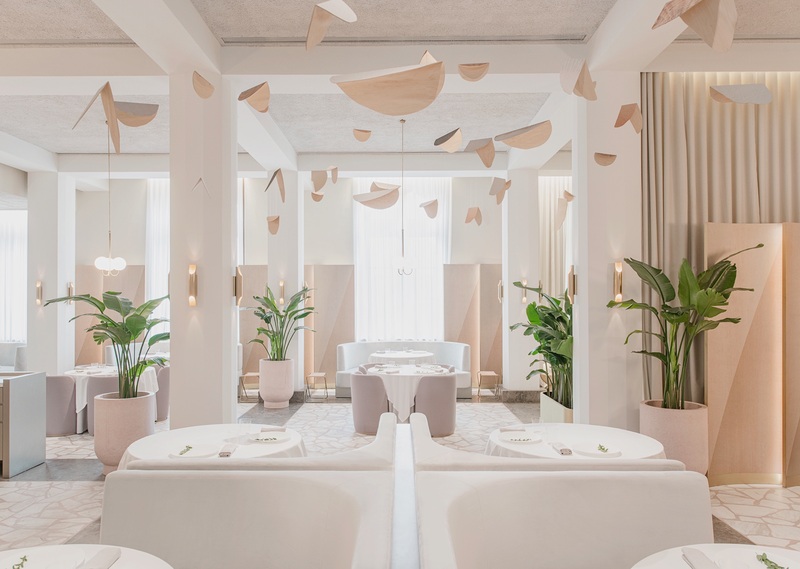 Everything in Odette oozes romance, from the dusty pink and rose gold colour interiors to the stately National Gallery Singapore it is housed in. It’s fine-dining, no less, with a slew of elegant modern French dishes. But you’ll find yourself warming up to the restaurant in no time, especially with the friendly and knowledgeable service team tending to you. Odette, 1 St Andrew’s Rd, #01-04, National Gallery, Singapore 178957. Tel: +65 6385-0498. Restaurant Zén may be a fresh face in the local fine-dining scene, but it has scored great impressions so far. This restaurant is an experience for those with deep pockets but is unforgettable nonetheless. Dinner progresses across the three floors of its shophouse: starters by the lounge, mains in the modern dining room and desserts at the ‘living room.’ It’s a homelier space than you would expect of most fine-dining places, which makes for a very comfortable environment. Those who aren’t drinking will appreciate the juice pairings offered with the dishes here. Restaurant Zén, 41 Bukit Pasoh Road, Singapore 089855. Tel: +65 9236-6368. It helps that Preludio is located on a quiet spot at the Frasers Tower, which means you can be guaranteed some privacy. The menu here changes periodically and currently is working on a monochromatic theme. Dishes here are intriguing and leaves for interesting small talk with your partner (read: no awkward moments). If you’re celebrating a birthday or anniversary, be sure to let the restaurant know ahead of time — the kitchen team may prepare a special chocolate pinata stuffed with homemade sweets to celebrate with. Preludio, 182 Cecil Street, #03-01/02, Frasers Tower, Singapore 069547. Tel: +65 6904-5686.